AutoGRAPH controller, installed on vehicle, constantly receive coded signals from Global Positioning System (NAVSTAR) and GLONASS satellites. These signals are used to determine exact coordinates of the vehicle location. The coordinates are written to the non-volatile memory of the AutoGRAPH controller, either on a regular basis or adaptively. Furthermore, the storage memory records and stores the statuses of various sensors connected to the tracker or data buses, and other parameters required by the software. Either on a regular basis or upon occurrence of a preset event, the collected data is transferred to the dedicated AutoGRAPH server over the Internet using General Packet Radio Service (GPRS) supported by a GSM mobile network operator or via Wi-Fi network. The server is a computer running Microsoft Windows Server with an Internet connection, permanent IP-address or domain name and reliable data storage device. The server is responsible for receiving data from AutoGRAPH controllers, storing the data and transmission upon request to the dispatcher stations. Key files are used to provide data access security on the server. Dispatcher workstations are personal computers, laptops or mobile devices that has either Internet access or server connection via LAN. 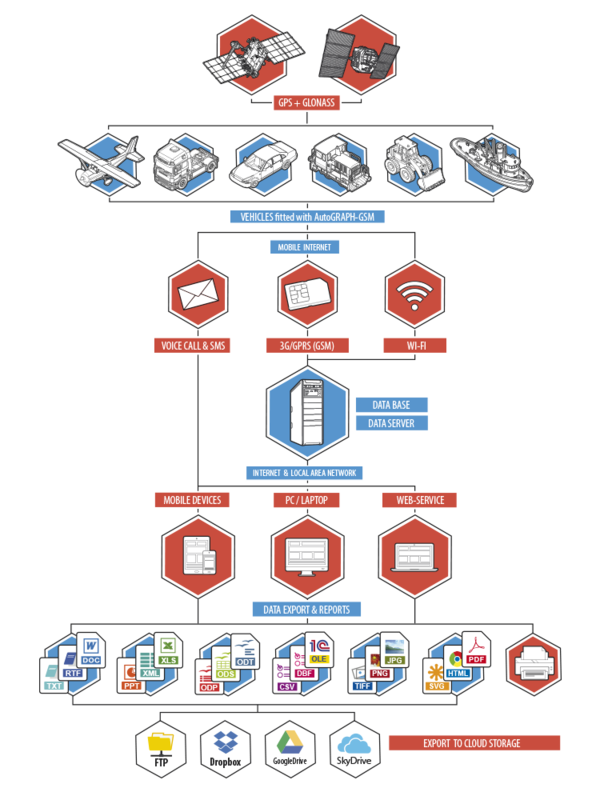 An Internet connection and computer with the Dispatch Software will enable users to obtain data from anywhere in the world. Easy deployment of the Dispatch Software without the need to install third-party database support enables users to immediately create new dispatcher workstations with any PC running MS Windows 2000/XP/Vista/7/8. The number of workstations is unlimited. 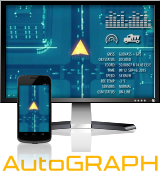 Users also can easily track vehicles using WEB based AutoGRAPH.WEB dispatch software run on any desktop PC with any OS or mobile device connected to the Internet. Upon the user’s request or on a regular basis the dispatcher workstation connects with the server to update data on. Depending on version of the AutoGRAPH Server Software, access to the data is provided according the controller key or the personal login and password. The received data is stored in a local folder on the dispatcher workstation that enables processing of the data without being connected to the server. Furthermore, to reduce the web traffic, the dispatching network may be organized in such a way as to send any missing data through the Internet to only one workstation, while all other users may use these downloaded data via LAN by retrieving them from the local data folder of the workstation. The users may use this data to track the vehicles on a map, browse through various parameters, events and readings of various sensors. In addition, it is possible to generate various types of reports and charts both for each particular vehicle and in groups. To interact with various external applications and handlers (including 1С), AutoGRAPH Software incorporates OLE server application (COM server) which enables data exchange between AutoGRAPH Software and the programs written in the majority of existing programming languages which support OLE enabled data exchange, as well as programs and systems based on their own embedded programming language (1С Enterprise, MS Office, various databases, etc.). Furthermore, there is an option to upload all tracking data and reports in the form of MS Excel, DBF and CSV files, as well as to use an external customizable reporting module which allows users not only to generate a large number of reports with fully customized layout, data and charts to be presented, but also to save them in many different formats to enable further processing, sending or presentation: PDF, Open Office ODS, Open Office ODT, MS Excel (OLE), MS Excel (XML), XML, RTF, HTML, TEXT, CSV, BMP, JPEG, TIFF, GIF. Control SMS commands and preset events enables sending of vehicle location coordinates and various notification messages to an ordinary cell phone of GSM standard by means of SMS messages. Furthermore, SMS commands can be used to configure AutoGRAPH tracker directly from a cell phone or a tablet. Audio interface build-in to AutoGRAPH-GSM+WiFi tracker provides communication with a driver by means of a usual call to a number of the controller’s SIM card. For feedback contact with a dispatcher two telephone numbers can be stored in the controller’s memory.